Home » » Onitsha traders, residents lament extortion by touts. Onitsha traders, residents lament extortion by touts. 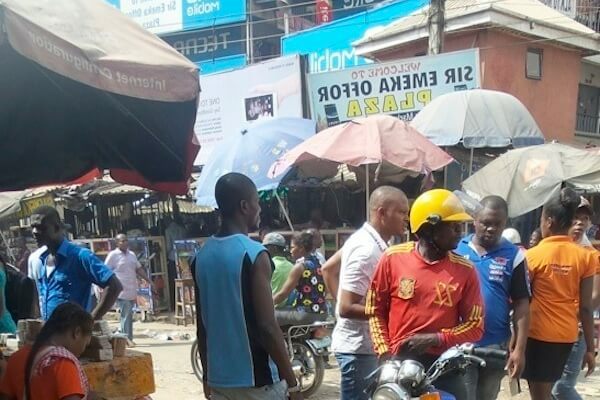 Traders and residents of Onitsha, Anambra State have cried out to Governor Willie Obiano to intervene and stop extortion by touts, who allegedly claim to be revenue agents. Daily Sun gathered that the boys most times wielded weapons to carry out their unlawful business of collecting illegal fees along Bidda Road, Sokoto Road of Onitsha Main Market and at some busstops at Upper Iweka, Lagos park and Bridgehead. Those who spoke with Daily Sun lamented the activities of the touts, who forcefully collect money ranging from N100 and N200 or more from traders and residents of Onitsha in the name of ‘land payment money’ for loads or goods bought in the market. While narrating her ordeal in the hands of these touts, Mrs. Ngozi Dindu said she was forced to give them N200 when they wanted to carry her goods where she was waiting for a carriage truck to take it to the park. A resident, Mr. Chijioke Obiora, lamented the activities of the touts, who visit any place there is building construction or repairs and borehole drilling to collect money or they would destroy things or carry equipment with out delay. “I’m calling on Governor Obiano to help us; so many things are going on in Onitsha. We are being extorted everyday. If you go to markets, they collect goods and land money; if you are doing any renovation or repairs in your building, they will come. They are ready to fight or destroy any of your items or carry one thing or the other if you refuse to pay. They collected N500 from me the other time, they don’t have fixed amount,” Obiora said. The Divisional Police Officer (DPO) in charge of Fegge Police Station, Onitsha, Mr. Rabiu Garba, a Chief Superintendent of Police, when contacted on the matter, said hoodlums have infiltrated the revenue agency in the area. “These boys parade different letters claiming to be revenue agents and we find it difficult to identify the genuine government revenue agents because they sub contract it to other people whom you cannot trace it to. “We have written to the state government, through the commissioner of police, but, since then, I don’t think they have come up with the best way to collect revenue in this area. “Then, many times we raided and arrested these boys and take them to court, nobody will come out to testify or give evidence against them to prosecute the matter, because the traders who claimed to be extorted would be nowhere to stand and defend it, making it difficult for us as police” Garba stated.